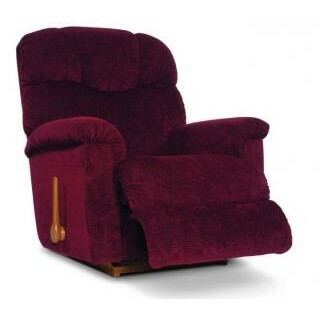 The Lancer Rocker Recliner offers channeled pillow back, flared arms and lushly padded seat and back. These features, along with the chaise, provide full body comfort and support. The Lancer is a mid-size rocking recliner which features thick padded arms and clean lines and is available with several of La-Z-Boy's best selling reclining mechanisms. Contact the store for complete details.